A couple of minutes ago another round of spam messages appeared claiming to provide information concerning a statement of fees recently posted (inferring to banking account fees). 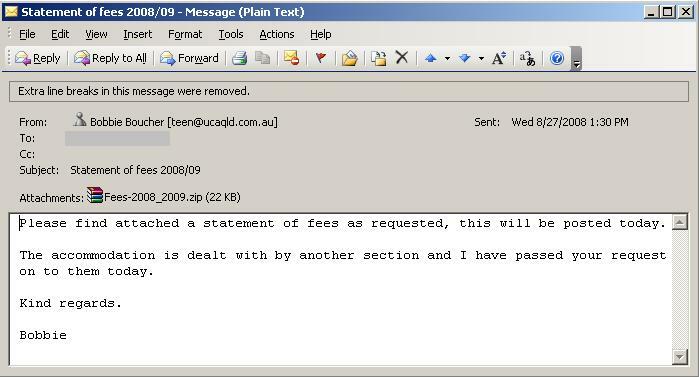 The message contained an attachment with a fake Microsoft Word Document which actually is an executable (Fees-2008_2009.doc.exe) that installs a Trojan Downloader. Further analysis indicates that the Trojan when installed connects to a php page hosted on a Russian domain to obtain several possible sites as a means of downloading the installer for AntiVirus XP 2008. The actual URLs are contained within this script and the file which is downloaded is lspr.exe (MD5 ffccd0518b04354532c733674c0faa00) and is identified as Adware/AVXP2008.